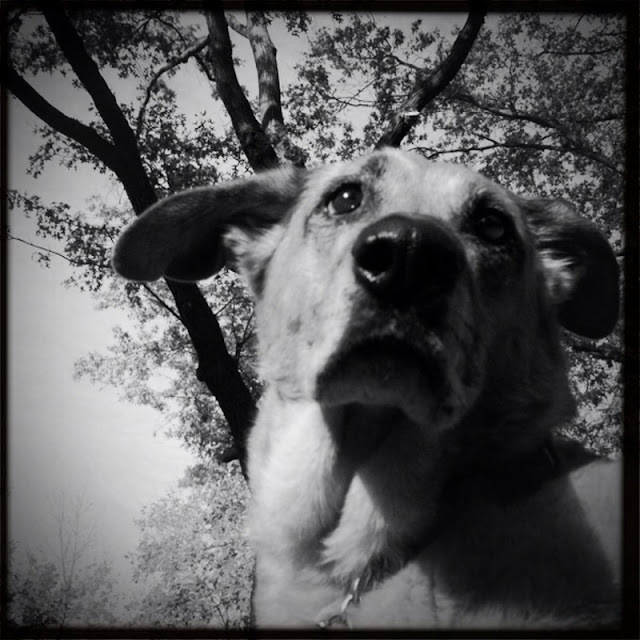 As you know, I like to take Willow on my photo walks with me. It was such a beautiful day on Monday, so we went to the park to hang out and take some pictures. She's always such a good sport while I run back and forth taking selfies--looking at me like I am a little crazy, and holding back the urge to chase after me when I tell her to stay. 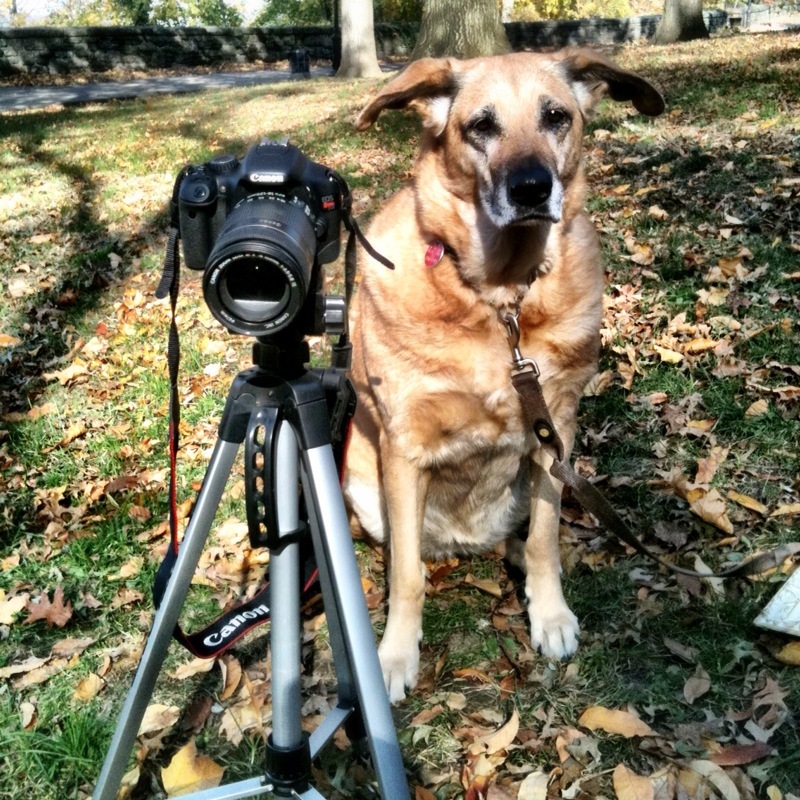 At one point she did get up from her spot--she walked over and sat right behind the camera and tripod. It looks like she was trying to take over my shoot! My furry little camera hog. Does anyone have the new iPhone 4S yet? I am due for an upgrade from my 3GS and I am wondering how you like the new model? Have a great weekend everyone! Looks like WILLOW took a selfie :). And she did a very fine job! Oh my gosh. Willow's ears are the most adorable thing I've ever seen. I love the black and white pic. That's a frame-able for sure! Now if you could just train Willow to start taking photos, that'd be pretty awesome. oh look at Willow... she's adorable. i especially love her look in the b&w one. She's just so cute, I want to squeeze her. Indeed, you should teach her to press the shutter for you. That would be a trick! Willow is so sweet! What a great buddy for photo outings! My daughter just got her first iphone and loves it, especially "the assistant". It has two cameras, right? Oh Willow is so sweet! Hubby has the 4S ... he loves it and won't share! But he came out of the dark ages from his Blackberry! Aw, what a cutie - looks like she knows what buttons to push. I have the iPhone 4s and I LOVE, LOVE it. I upgraded from the 3G, which was really slow and antiquated. The really nice thing about the iPhone 4s camera is the ability to AE/AF lock. Even my DD's iPhone 4 doesn't have that feature. I'm loving me some Willow!!! I can never get over that sweet face of hers! what a cute and adorable pup! I LOVE your photography and your blog. i just want to smoochy that pretty face!! I think Willow is a camera hog. What do you think? Maybe she wants to be in her own montage of selfies. Willow looks equally comfortable and placid behind the camera as in front. Good companion for your shoots. HA!! Totally looks like Willow is the photographer! Tooooo cute. I have also been wondering about the switch from from the 3 to the 4...the camera alone seems to have me wooed. Dang, that dog is smart! :) Very cute photos. Cute, furry camera hog. :) I want to upgrade to the 4s from my Droid. I have to wait till July though. Let us know how you like it when you get it! What a lovely dog ​​and very nice pictures. What a sweet face! I think you should give her a remote and put her to work! Cute photos of your dog, the second one looks like she's going to take a photo of you! Willow looks like a great sport! And VERY trustworthy, too (if that was my cat behind the tripod things would have gotten very scary in a hurry - noooooo not the camera...)!